Inventory management is one of those behind the scenes processes that can have a huge impact on customer experience and business success. Whether your organisation is a small start-up or a large multi-national, inventory management will be crucial to ensuring that you have an accurate understanding of stock levels and locations so that items are always where they need to be. If you’re looking to improve your company’s inventory management there are some easy ways to do it. 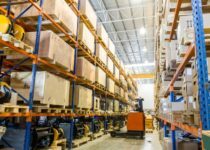 Mismanaged inventory can be costly in a range of different ways, from overstocks and stock shortages to warehousing and shipping costs. Analytics based on past inventory records and reports will give you essential insight into how inventory levels have been managed in the past and the impact this has had on cost. With this information it’s possible to optimise inventory levels so that you are always working with the right volume of stock to avoid both stock shortages and the cost of storing excess stock. It’s essential to track inventory levels on an ongoing basis so that you have a clear and accurate picture of where your stock is at all times. There are a range of tracking and management tools that are available to help you to do this, with options such as automation and bar code scanning to help reduce mistakes and ensure that you can track stock throughout the business. Tracking and management has many benefits for any business looking to better manage inventory for more accuracy. It will mean that stock is always ordered on time – avoiding stock shortages – and the potential for mistakes that lead to over-ordering is minimised. It will also provide you with other options for greater efficiency, such as creating purchase orders and tracking the process of picking, packing and shipping. It may be necessary to prioritise effort and resources where inventory management is concerned and the only way to do this effectively is to know your inventory in detail. Which products are the most popular and frequently purchased? Often, 80% of demand is generated by 20% of products – if you know which products generate the most demand for your business you can focus on ensuring that these items are effectively managed and this will dramatically improve the efficiency of the business overall. Particularly if you’re reliant on technology as part of inventory management, you’ll need to ensure that you have effective data back up in place. In the event that there is a tech failure – or your systems are hacked – ensuring you still have access to key data will be essential to keep the business running. From simple tracking tools through to inbuilt analytics, there is a broad spectrum of inventory management software available to make your business more efficient and accurate. Whatever your goals – whether that’s reducing inventory mismanagement, improving inventory visibility or increasing business competitiveness – inventory management software is an effective investment that can help you to achieve key objectives. At UCS we are experts at inventory management – we offer an online management portal, which allows you to simply monitor your stock level in real time. Contact us to find out more. next post: What concerns are there about packaging transparency in Europe?